Pakistan batsman Azhar Ali is poised to foray into County Championship. He has signed up with Somerset CCC as their overseas player in the remaining part of the 2018 Division One season. Azhar has been roped in by Somerset to replace the injured Matt Renshaw. The Australian opener, who himself had been an eleventh-hour replacement for the suspended Cameron Bancroft, broke his finger during the club's clash against Surrey at Guildford last month. Somerset Director of Cricket, Andy Hurry stated, "Finding the right fit at short notice can be challenging. 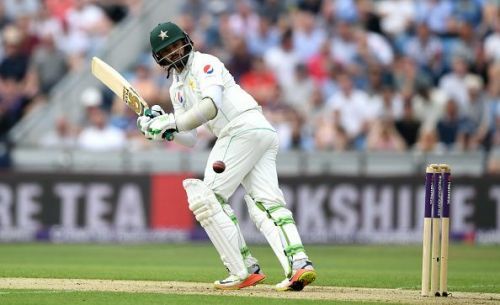 However we are delighted to have secured a player of Azhar Ali's character, pedigree and class for the remaining seven Specsavers County Championship matches." He added: "His (Azhar's) experience at the top of the order will prove to be hugely valuable at the business end of the season. I have spoken to him several times over the last few weeks and he is very keen to share his knowledge of the game with our aspirational players. So the influence he can have within the changing room will also be vital for us as a club." Before injuring himself, Renshaw played six matches and amassed as many as 513 runs at an impressive average of 51.30 with three centuries as well as one fifty. Having accrued 97 points from seven games, Somerset are currently at the third spot in the Division One Championship Table. Azhar will make his County Championship debut during Somerset's upcoming away clash against Worcestershire. The match is set to start on the 22nd. The top-order batsman's seven-match deal with the club will see him become available for all fixtures until the end of the ongoing season. A delighted Azhar affirmed, "The standard of first-class cricket in England is very high and I hope that I can make a contribution to Somerset winning matches. I have heard good things about Somerset and I was impressed by what I saw at Taunton in 2016. I am looking forward to joining my new teammates and meeting the Somerset supporters soon." Since making his debut at the Lord's Test against Australia in 2010, Azhar has grown in stature to become one of the most reliable batsmen in the contemporary game. The technically accomplished right-hander has featured in 65 Tests thus far and accumulated 5202 runs at a remarkable average of 44.84. He has converted 14 of his 42 fifty-plus Test scores into three-figures.